October Report ~ 166 Authors with 393 Comments! 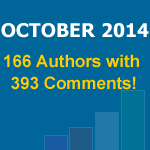 →October Report ~ 166 Authors with 393 Comments! It’s been another exciting month here on EnstineMuki.com. Despite being so busy and not interacting around as usual, I still see an encouraging level of engagement on this blog. It’s such a wonderful thing to have an active community of loyal readers who have vowed to stick to my blog always. Though BroadedNet is taking quite some time, I do make considerable effort to post valuable content here. I have also had some guests that, from time to time chip in some magnetic posts. NB: BroadedNet is a traffic and blog promotion platform. It’s free to join so you can sign up right this moment. Meet over 500 bloggers who already enjoy the benefits of targeting traffic without SEO or SE. You don’t waste your time on this platform. Just copy and paste your posts’ URL and titles. I’m so thankful to everyone of you reading my blog. Every single minute you spend here on this blog is worth so much. This blog won’t be where it is without your input. I love your comments, shares, tweets, etc. I dropped 19 awesome comments. Hi, My name is Adesanmi Adedotun. I made 14 awesome comments. Hello, My name is Kailash Chandra. Hello, My name is SANDESH CHAUHAN. Hello, My name is Ngwu Chinedu Joseph. Hello, My name is Samuel. Hello, My name is Rahul Patel. Hi, My name is Shihabudheen K.
Hi, My name is Funmy Kemmy. Hi, My name is Kenny. Hi, My name is vandefan. Hi, My name is Kellog. Hi, My name is Md. Hamim Mondal. Hello, My name is Neamat Tawadrous. Hello, My name is faheen. Hi, My name is Nathaniel Kidd. Hello, My name is Nitin mohan. Hi, My name is Kamal. Hello, My name is Shahbaz Ali Sayyed. Hello, My name is Nishant Bazzad. Hi, My name is Lakshman. Hello, My name is Dennis Seymour. Hello, My name is Chris Goldberg. Hi, My name is Dev Rajak. Hi, My name is Eedris Saminu. Hello, My name is Sumit Thakur. Hello, My name is Mohd Arif Khan. Hi, My name is Pankaj Bhatt. Hi, My name is Kuldeep Biswal. Hi, My name is Irfan Siddiqui. Hello, My name is Rohit Sharma. Hello, My name is Darragh McCurragh. Hello, My name is k r shah. Hello, My name is phần mềm theo dõi điện thoại. Hi, My name is Satyakam. Hello, My name is Nitesh. Hi, My name is Monika. Hi, My name is Soumyakanti Ray. Hi, My name is qae6 Pandey. Hello, My name is Avinash. Hello, My name is Val. Hello, My name is Saket. Hi, My name is couple rings singapore. Hi, My name is Akshit Wadhwa. Hello, My name is Virtuo Rohit. Hello, My name is Corinna. Hello, My name is Arbaz K.
Hi, My name is Ruth. Hi, My name is javeth. Hello, My name is Jamie Clifton. Hello, My name is Jane. Hello, My name is Nwosu Desmond. Hi, My name is Babshaybell. Hello, My name is Ryan Biddulph. Hello, My name is Minakshi Srivastava. Hello, My name is lakshman Teja. Hi, My name is myrujukan. Hi, My name is Nisha. Hello, My name is Nanda Rahmanius. Hello, My name is Kevin Davis. Hi, My name is Bhargav Gupta. Hello, My name is Mustafa Gaziani. Hi, My name is Mahendra Kumar. Hello, My name is ankit pathak. Hi, My name is Deborah. Hello, My name is Atif Imran. Hello, My name is Gurwinder Singh Bhinder. Hi, My name is Victory. Hi, My name is Akshay Sharma. Hello, My name is Abrar Mohi Shafee. Hi, My name is Divyansh Peswani. Hi, My name is Brittany Bullen. Hello, My name is Gilbert. Hi, My name is Ngwu Chinedu. Hello, My name is Trev Jones. Hi, My name is Ovais Mirza. Hi, My name is Subodh Gupta. Hello, My name is Amitkumar. Hi, My name is Michael Chibuzor. Hello, My name is Uju. Hello, My name is Tharun. Hello, My name is Ngah Benoit. Hello, My name is Sinclair. Hello, My name is Richard Martin. Hello, My name is Ajay Kumar. Hi, My name is Danyal. Hi, My name is Internet Marketer Babs. Hello, My name is Aditiya. Hello, My name is Soumya Roy. Hi, My name is ity williams. Hi, My name is Stuart Davidson. Hello, My name is campy. Hi, My name is Veer. Hi, My name is Jesson. Hello, My name is GH. Hi, My name is Shubham Mahajan. Hi, My name is Techengage. You can be on this list for the current month. Just drop your comments and interact with us. I’ll like to read your comments below. I congratulate myself for topping this list of comment authors on your blog 19 awesome comments. I hope to do the same in this new month. Thanks for updating us and have a nice day ahead. Once again thanks for mentioning, commenting on your blog is nothing less than a worthy honor of me Enstine coz your work and efforts for us are really helpful and great and it forces me to comment on every post I read on your blog. Thanks once again, keep writing! Wow i made 8 comments its amazing i m very happy to see my name in this list again.last month i made only 3 comments. it’s amazing the number of comments you get every month. You were able to build a very nice community around your blog. And keep up the great job. Thanks for being part of this wonderful community Erik. Each day comes with better things. We cannot avoid having another wonderful experience this month. Good to see so many familiar faces and mine here as well. Love your plugin, great going! Thanks for the constant support dear friend and congratulations on your new phase. Being busy is a sign of growth and I love it when new things happen. This is good . Thanks for acknowledging and mentioning my comments on your blog. Hoping to do more. Well done. Thanks for this engagement report. I always love to see myself here. See you at next post. Have an awesome day! I’m aware of those issues. Way Cool! I’ll be by to drop a TON more comments this month, def more than 1. And not just because I’ll be back tomorrow for…..ahem…..well, you know 😉 Seriously though, I’m trimming down my blogging list of places to visit and am only visiting blogs with engaging communities, and since you have one of the most engaged blogs I’ve seen, well, I’ll be stopping by frequently. Thanks for the shout out Enstine, and once again what a fab idea! Tweeting from Bali. I forgot to tell you one thing! Hey you have been mentioned in my latest post! If time permits pl. do have a look. I saw a track back and was there. I have scheduled to come around and share in a short while from now. I have heard you talk about BroadedNet yet I have not had time to check into this as of yet,, I will add this on my to do list for the day..
I’ll never stop mentioning and thanking you for being a loyal reader. You are surely going to be mentioned again in my next report. The community here is growing at a geometric progression and I’m certainly glad to be part of it…your effort in both promoting the members and writing the awesome code for the Comment Authors plugin is also commendable. I hope to check on you in the coming days – with regularity. I’m glad things are going well for you with Broadednet and I know it can take some time to get things working properly and tweaking it to perfection. That last hack scare was not fun I’m sure. Sorry I haven’t been by here more but as you know my head is down trying to get my product ready for is’t release. I’m slowly getting there but I hate not visiting all the blogs I normally do. I’m missing me some darn good content now. Thanks for mentioning me and again, sorry I’m falling down on my job but you know I love and support you my friend. Now I’m going to keep my fingers crossed that this comment goes through this time. In the meantime, you have a wonderful week. Thanks again for stopping by despite the last minute busy moments. That’s for supporting broadedNet. Glad to see that everything is working out so well with your fantastic plugins and all that great stuff. I would like to think that the main reason for you being busy is a sign of growth and expansion on business side of things for you. So I say congratulations! Thank you for the wonderful honor of mention in the list of commentators. It’s and improvement for me from the previous month I believe – from 5 to 7. Happy to engage and to add value where and whenever possible. It is a wonderful thing to have such a wonderful Community of readers who are loyal to you and enjoy your valuable content and keep coming back over and over again. The month of October seemed to fly right by, and I can only imagine what the rest of the year is going to be like – Zoom! I will probably be able to engage on your site even more this month, Lord willing. God willing, we will have a warmer engagement on our blogs this new month my dear friend. You keep inviting supper awesome bloggers on your blog. Who will not want to be associated with such? I’m so happy I saw my name above. Thank you very much for this. I am so honoured that you like and love our comments with your blog. I can’t wait to read your amazing and awesome article. Very glad to see my self on this list. You are really a helpful guy. I am always eager to read your amazing blog posts. Have to learn lot’s of thing from you. That’s why I’m so proud of you as a loyal reader. Each minute you spend here is so useful to me. I really appreciate and thanks for coming back. Wow, This is awesome post.I am always read your amazing blog posts. Nevertheless, it’s a joy to read again! Thanks so much for sharing it again on your blog.